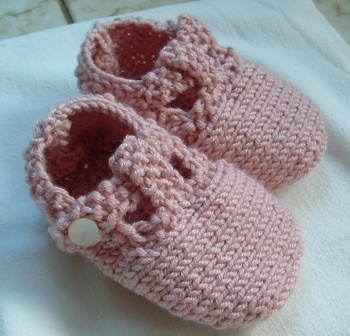 The pattern is the Simple T Strap Shoe from the book 50 Baby Booties to Knit by Zoe Mellor. I used Debbie Bliss Cashmerino yarn. Yummy. The pattern was straightforward, pretty easy, and they were quick to knit up--even on size 3 needles. But for some reason when I knit, I don't feel like sewing...and I think her patterns require a lot of sewing, so for that reason this is only the second pair of bootees I've knit from this book in the three years that I've had it. Oh well, another bad knitting book investment. Now on to finishing the Wild Stripes baby blanket--I'm almost done, just lots and lots of weaving in of ends to finish.